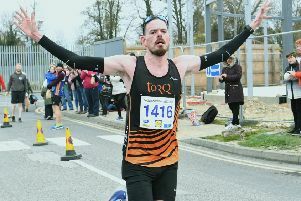 Eye Runner Lee Whitton is no stranger to bizarre challenges, but he topped the lot of them on Saturday winning a 24-hour running competition. The event called ‘Escape from Meriden’ began in the Warwickshire village of Meriden, and the object was to run as far away from the village as possible in 24 hours in any direction you chose. The winner would be the runner furthest from Meriden, as the crow flies, at the end of the 24 hours. Whitton, aided by his support crew, incredibly reached the Dorset town of Shaftesbury, having crossed Gloucestershire and Wiltshire after leaving Warwickshire. Some runners made it to London, while one reached the outskirts of Leeds, but Whitton had planned his route wisely, and as the clock struck midnight he had covered an extraordinary 121 miles, and was 100 miles from the start point, as the crow flies. Nene Valley teenager Nandeli Pelembe finished fourth in the 1000m at the Northern Athletics open indoor meeting in Sheffield, running a PB of 2:54.28.